First Impression: Charming. Very, very, charming. My Opinion: I wasn't quite sold on this one at the first episode. I bumped into this show, which I had otherwise scratched off my list, thanks to a video on youtube by the channel Digibro. For the first episode, my original fear for this show never really went away, that it could be primarily about the diving. Like a sports show, is about the sport. I don't like that in a show, especially not anime. If I enjoy some kind of activity, I go do it. I don't sit around watching it. If I'm watching someone do an activity I would otherwise be enjoying myself, it's because I'm watching it for them doing it, not because of what they're doing. This is also traditionally to this day, the only time I've ever enjoyed shows that strongly featured a sport or game as one of its central foci of activity. They have to be more about the characters doing the thing, than the thing itself. 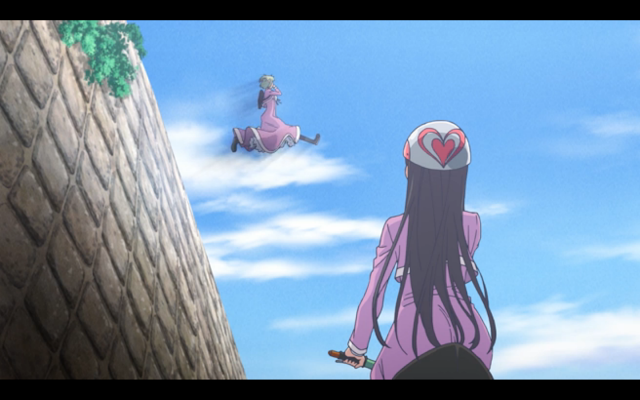 Amanchu has this in spades. The two main characters are essentially the only ones we've seen getting screen time for the first two episodes, and they are worth it. There's nothing particularly amazing about them in terms of stereotypes, tropes, or characteristics, but they are very charming, and they have an amazing synergy for just being entertaining to watch. The kind of 'what are they going to do next' excitement type. Hikari is energetic and optimistic, and while she strikes as an air-head at first appearance, I don't think she actually is. Certainly she's missing ... all...of the social cues, but she's having fun with it the entire time. Meanwhile, our second main, Ooki, is introverted, without that being the only thing that defines her. Which is great. I've had it up to here(hand way above head) with characters that are completely defined by their introversion. They're almost always boring outside of pure comedy sketches. Ooki has just moved to what can only be described as a backwater town to her, after having lived in a huge city, and she's left all her friends and connections behind. Hell, I'm even willing to say she's probably left behind her style of living too. She has a penchant for calling everything 'an unfamiliar world'. Someone did a great job not only drawing up this character, but the animators also did a good job bringing her to life. This is the first time in a good while I've found a character who was introverted charming in an anime. Usually it's just an irritating feature that drags out plot events much longer than they should have been, like it's the only thing holding the drama up. Long story short, the two main characters are wonderful, they have great synergy, and the show appears to be primarily about them and their interactions instead of primarily being about diving. I think Hikari is hilarious, even though I know her over-the-top almost childish behavior would be annoying to some. for this season, for slice of life charm and light-hearted comedy.